Every business has its own set of assets. Holding assets is a part of any enterprise in the public or private sector. It’s important that business owners know what theirs are as they need to know the best ways in which they can use them. 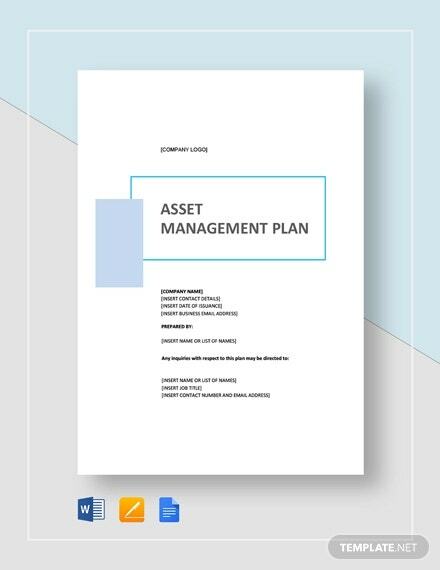 You can also like management plans in PDF. In order for them to do that, they’ll also need to come up with a simple plan that will allow them to make full use of whatever business assets they happen to have. 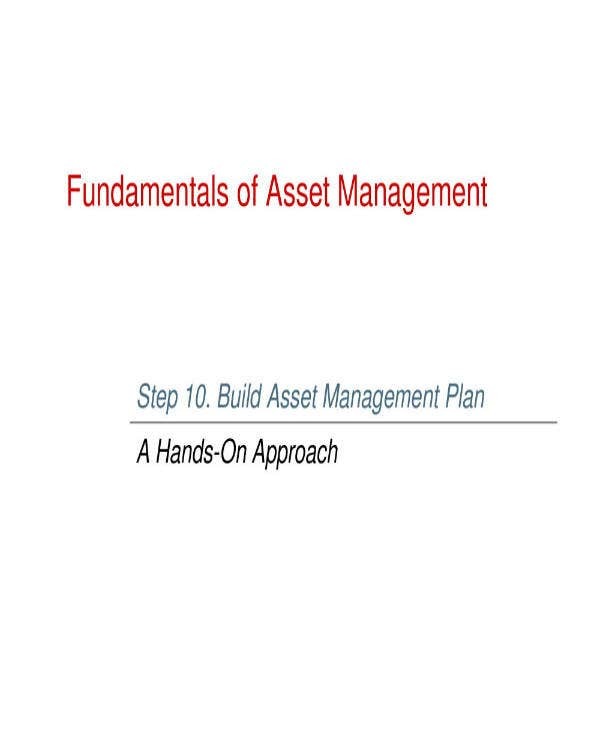 And that’s why this article is going to teach you how to come up with an asset management plan template. Remember that the entire purpose of having this type of plan is so that you can come up with the means in which you can fully utilize all of your business’s assets. 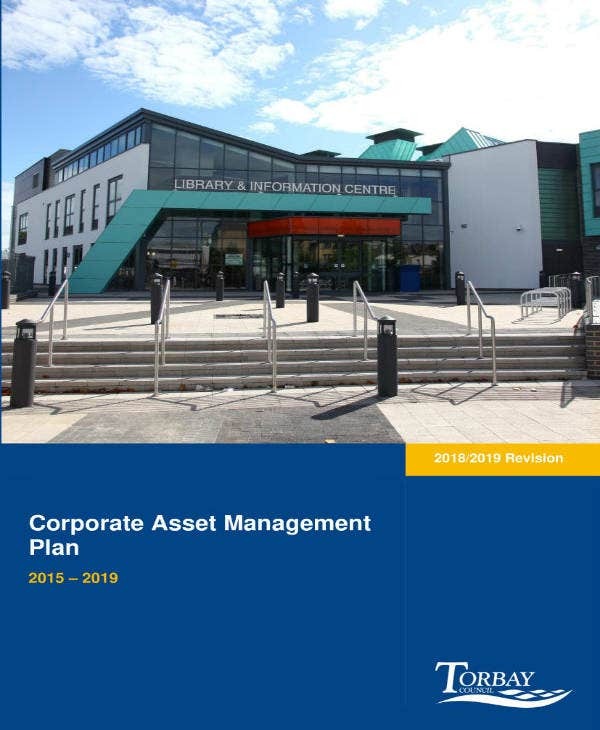 Developing and implementing a strategic asset management plan will allow for a detailed understanding of what physical assets are currently held, their value, future value, and costs associated with maintaining them or disposing of them. You can also like data management plan templates. Basically, it will help you realize what it is that you can do with them and the best way in which you can manage them. If you can do that, then you’ve pretty much taken a step closer towards the path to success. You can also read sample project management plans. The first step that you’re going to have to take is to determine which assets need to be purchased or otherwise made available. This part of the strategy will also include financial planning which details how much funding is available in order for you to acquire all of the necessary assets as well as let you know where the funding is going to be coming from. Take note that this phase will also tackle any replacement assets. You have to make sure that you only assets that have been deemed as absolutely necessary for the business will need to be acquired. Also, cost to benefit analysis should be calculated before acquiring or leasing an asset. Just make sure that you know what kind of assets that you need and how much you’re going to have spent in order to acquire them. That way, you can guarantee that your business has all of the items that it’s ever going to need in order to operate. You may also see quality management plans. Once you have planned out what kind assets you’re going to have to acquire, the next step is for you to come up with a plan that will cover how you should use your business’s existing assets. 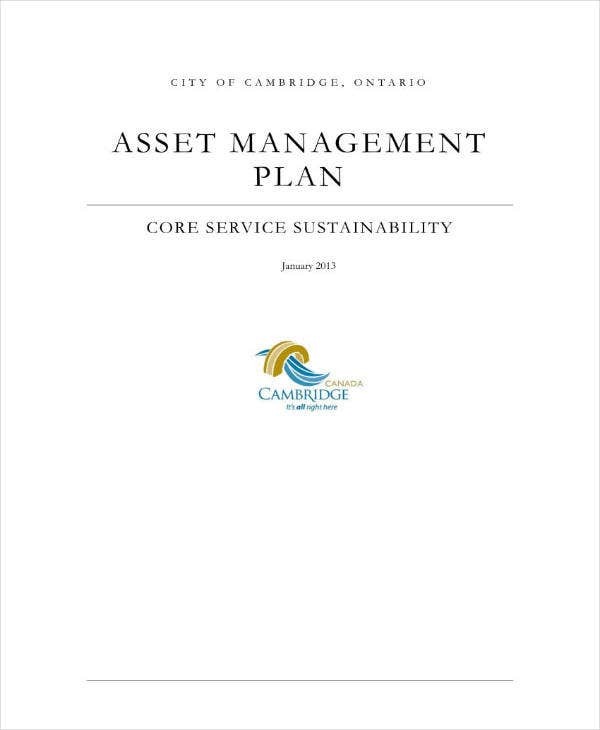 This section of the plan should point out all of the existing assets as well as what their functions are. This will allow you to get a better idea of the exact role of the asset, how secure it is, who is accountable for it and how well it is performing. You may also see crisis management plans. During this phase of the plan, you need to consider all of the different operating costs for every asset. You’ll need to know how much you’re going to spending for certain operations so that you can realize just how much you’ll need to learn to break even and eventually gain a profit. You may also like project management plans. Take note that if any training is required in relation to the asset it should be factored into this phase of the strategy. For example, an industrial water filter will have a certain cost attached to its function over time. Including this operational cost will let you compare it to other costs so that you can come up with a management strategy for its usage. You can also read construction management plans. All assets will require maintenance over time to continue serving your organization as well as they can. 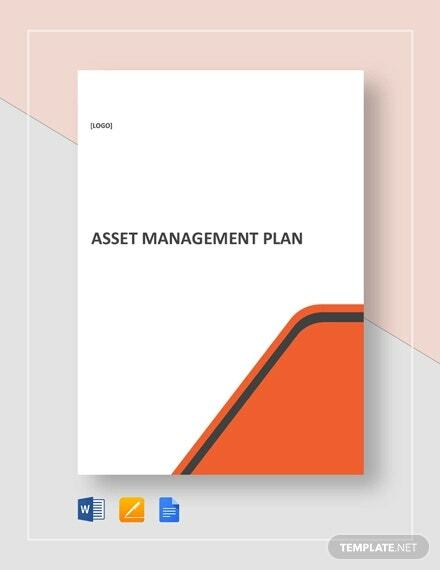 So in this section, you’re going to have to come up with a plan in which you will be able to come up with the means in which how the maintenance of all of your business’s assets should manage. This phase will also detail what level of maintenance they will receive and who will be responsible for that maintenance. You’re going to have to be clear on all of this as this is vital in ensuring that your business can keep making use of important assets. 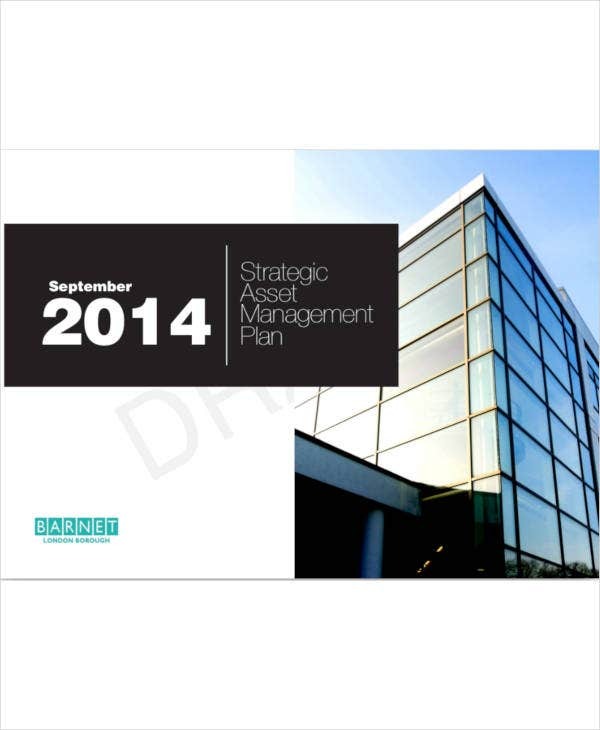 You may also read change management plan templates. Keep in mind that all of a company’s assets are important for carrying out the strategic plan. Take note that every single one of your business’s assets is going to need some form of maintenance eventually, meaning that you’ll need to have some idea as to when that’s going to be and how your employees should go about in handling it when the time comes. You may also see risk management plans. So make sure that you are able to give all the details regarding how they should go about in maintaining specific assets, as well as the probability of when they’ll need to do it. Also, be sure to include projected costs of maintenance over time. Although you can’t exactly come up with an exact number, you should be able to provide an estimate by doing your research and figuring out how much it would take to maintain a particular asset. You can also read classroom management plans. Although you’ve already planned out how you’re going to handle your current assets, take note that you’ll also have those that aren’t exactly all that important or have no particular use to the business. 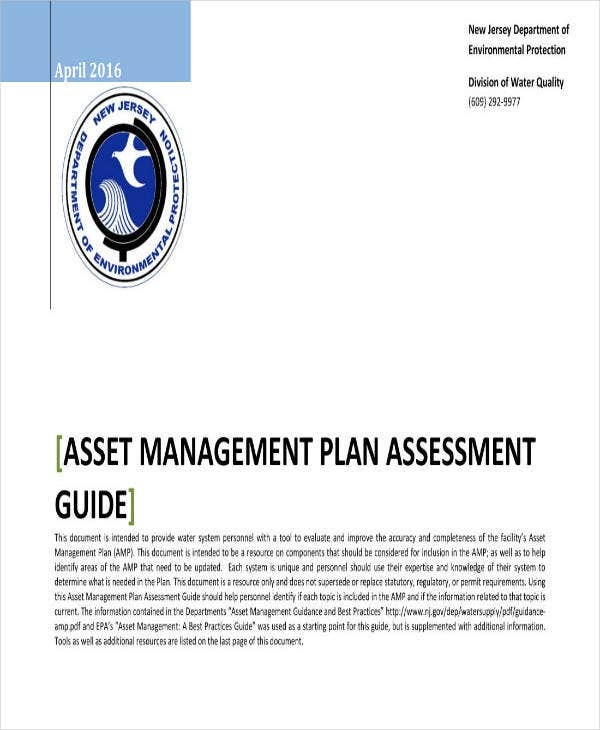 These are assets that you should get rid of as soon as possible and you’ll need to include the details of what these assets are and how you’ll dispose of them into the plan. You can also read change management plans. So what you will need to start out with is the reason as to why these assets are being disposed of. Make sure that you are able to explain it clearly when writing it down in the plan. Next is that you should come up with a list of the ways in which you would like these assets to be disposed of. It doesn’t matter how, just be sure that you, your employees, or your business won’t’ get into any legal trouble by doing the disposal methods. You may also read risk management plans. Remember that all assets should have a disposal plan that details when they are to be disposed of and when. Point that out and you shouldn’t have a problem in getting rid of them. You have to know that whether you gain, maintain, or hold assets, there will be a certain amount of funding that will be required. During the funding phase of your strategic asset management plan, you will need to detail where the funding for each asset is coming from, how much funding is being received, what these funds are being used for specifically, and whether or not they are recurring. You can also read crisis plan templates. You’ll need to consider the cost of an asset during its entire lifetime. You must also consider the costs of disposal as well as any funds generated from the sale of disposed assets. Just make sure that you are able to get all of the exact figures and place them all in the plan. You may also see plan templates in PDF. No matter what kind of business you’re in, you should know that there will always be risks that could potentially harm your assets. Losses include downtime, customer relations, poor press, and other factors that may damage value. So coming up with a plan in which you can deal or prevent these risks from doing any harm will definitely help you feel secure about your business’s assets. You can also see project plans. Keep in mind that all of a company’s assets, whether they are physical, financial, human, information or intangible, will have different risks associated with each of them. So what you’re going to have to do is to think of all the possible risks and put them in a list. That way, you’ll know exactly what it is that you and your employees are going to have to deal with. You can also see free sale plans. Once that’s done, you’re going to have to come up with the means in which you will deal with these risks. Come up with the methods that will allow you to effectively deal with them. Take note that you will also need to consider funding when it comes to the actions that need to be taken. So what you’ll want to do is to come up with prevention methods that are cost-effective and efficient in ensuring that these risks do not cause problems to your business’s assets. You can also see sample action plans. If you would like to learn about the other types of plans that you could possibly create, then all you have to do is to go through our site. It has many different articles and they all have information that should be able to give you the help that you need. Just be sure that you read them thoroughly so that you can make the most out of whatever it is that they have to offer. You can also see business plans.